Brand-new planes bring total Cebu Pacific fleet to 61 aircraft. The Philippines' leading carrier, Cebu Pacific Air (PSE: CEB), increases the frequency and capacity of its flights to Cebu, Davao, and Hong Kong, upgrading the aircraft from an Airbus A320 to an A330. The increase in frequencies comes as CEB added two brand-new aircraft into its fleet. Starting July 4, 2017, CEB will be increasing frequency of its Manila-Hong Kong route by 50%, resulting in thrice-a-day flights, or a total of 21 flights a week, from the current twice-a-day. 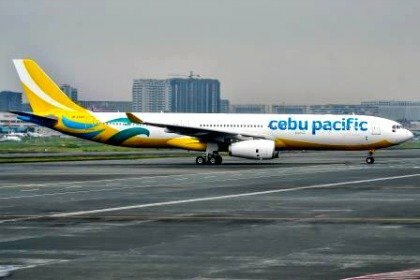 CEB will also use the A330s to fly between Manila and Cebu three-times daily, or 21 times a week; while the Davao hub will get a boost with two additional daily flights to and from Manila, bringing frequency to four times daily, or 28 weekly flights. The upgrade from a 180-seater A320 to a 436-seater A330 makes available an additional 256 seats for each flight, or 59% more capacity. "More seats and more flights in high-demand destinations will help lower fares for everyJuan. Moreover, using larger aircraft will make flying more efficient, freeing-up some aircraft and slots at the Ninoy Aquino International Airport. This will also enable us to increase capacity and frequency for other routes moving forward," said Atty JR Mantaring, Cebu Pacific Vice President for Corporate Affairs. The brand-new ATR 72-600 aircraft, on the other hand, will form part of the existing ATR fleet of wholly-owned subsidiary Cebgo. The latter recently announced five new domestic routes set to start operations in July, namely: Cebu to Masbate, Cagayan de Oro to Zamboanga, Davao to Dumaguete and Tacloban, and Zamboanga to Cotabato. CEB boasts of one of the youngest fleets in the world, with an average aircraft age of 4.99 years. The carrier's now 61-strong fleet is comprised of four Airbus A319, 36 Airbus A320, eight Airbus A330, eight ATR 72-500, and five ATR 72-600 aircraft. Between 2017 and 2021, CEB expects delivery of 32 Airbus A321neo, and 11 ATR 72-600 aircraft. CEB currently offers flights to a total of 37 domestic and 26 international destinations, operating over 100 routes spanning across Asia, Australia, the Middle East, and USA.